The Acropolis is the most important archaeological site of the city, the watchword of Athens in particular, and Greece in general. The meaning of the word ‘Akropoli’ city high, do honor to his name, as the site on which it stands is 156 meters above sea level. 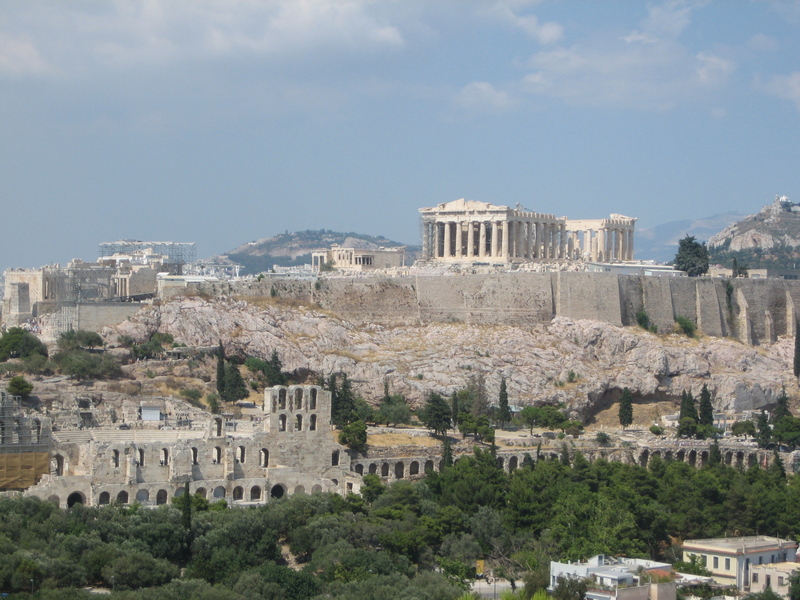 All ancient Greek cities had an acropolis, the highest part of the city, which served as a place of defense against possible attacks and sanctuary for the local gods. 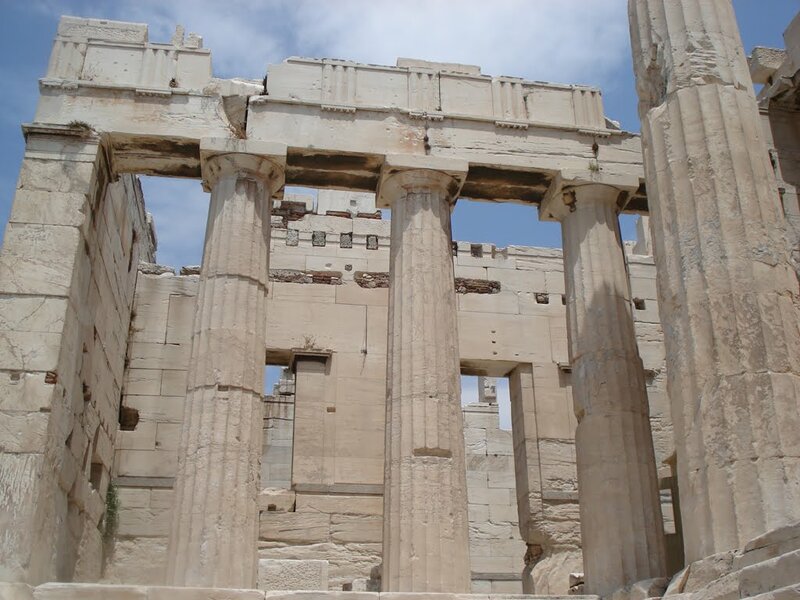 Conceived as a fortified and a place of worship, the Acropolis housed inside some of the most representative buildings of ancient Greece, the Parthenon as the most significant temple, considered even today as the ‘crown jewel’ of the Greek architecture. The Propylaea, the Temple of Athena Nike, the Odeon of Herodes Atticus, the Erechtheion and the Theater of Dionysus, on the southern slope are the main structures currently completing the archaeological site. In the Athens of Pericles during the second half of the V century BC, an exceptional group of artists transformed under the direction of Phidias, a rocky hill in an extraordinary architectural and artistic ensemble that ancient Greece bequeathed to the world. The Acropolis of Athens’ sacred rock “is a limestone plateau 270 meters long and 85 wide, situated 156 meters above sea level, which contains the most famous monuments of classical Greece: the Parthenon, the Erechtheion , the Propylaea and the temple of Athena Nike and represents the universal symbol of the spirit and classical civilization. It was declared a UNESCO World Heritage Site in 1987. The entrance to the Acropolis is via a monumental gate called “Propylaea”. A large bronze statue of Athena, built by Phidias, stood at the center of campus. To the right of this statue the Parthenon that housed the statue of Athena Parthenos crisoelefantina also Phidias stands. On the left the Erechtheion was available. They were built on ancient Propylaea from the time of Pisistratus by Mnesicles Athenian architect who had to deal with important functional and architectural problems of the terrain and available space as the Propylaea were at the edge of the upper concourse Acropolis, at the boundary between the slope of the ascending pathway and the horizontal plane of the Acropolis. 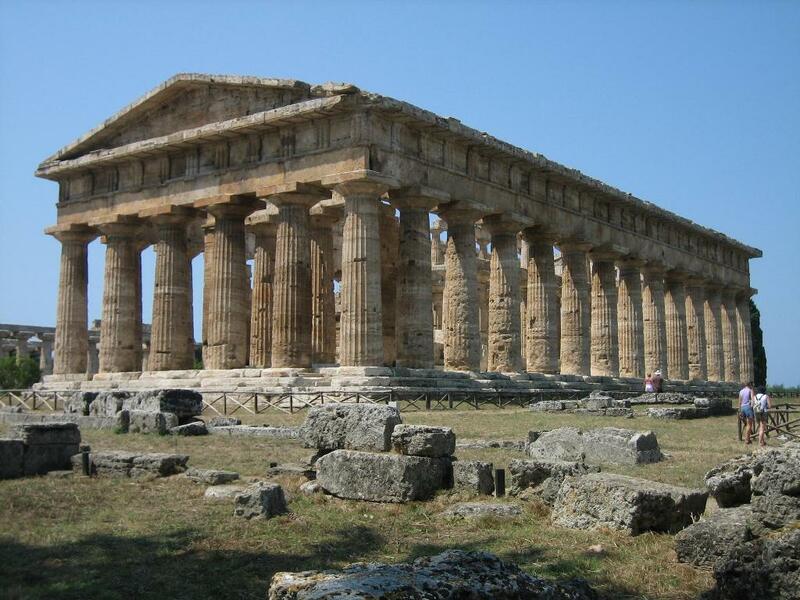 The Propylaea included a rectangular central building of 18.12 meters wide and 12.96 meters deep and two side wings. The central body had an exterior facade and indoor formed two six Doric columns that marked five-door access to the Acropolis, the being wider in the center (4.13 meters wide and 7.38 meters high) that was where ran the sacred way that roamed the Panathenaic procession. These two hexástilas facades were too far apart to hold the roof composed of marble coffered ceilings so they were used in more slender Ionic columns inside the Doric to maximize space. The building mixed by both Doric and Ionic orders as in the Acropolis. Of the two buildings that formed the side wings, located north housed the Pinacoteca art gallery where paintings on wooden plates were exposed. The south, smaller wing consisted of a hall, leading to the west, the temple of Athena Nike. It is the greatest monument of the Athens of Pericles and the architecture reflects the extraordinary cultural flowering of the arts and thought that reached Athens during the V century. C. culminating in the establishment of democracy. 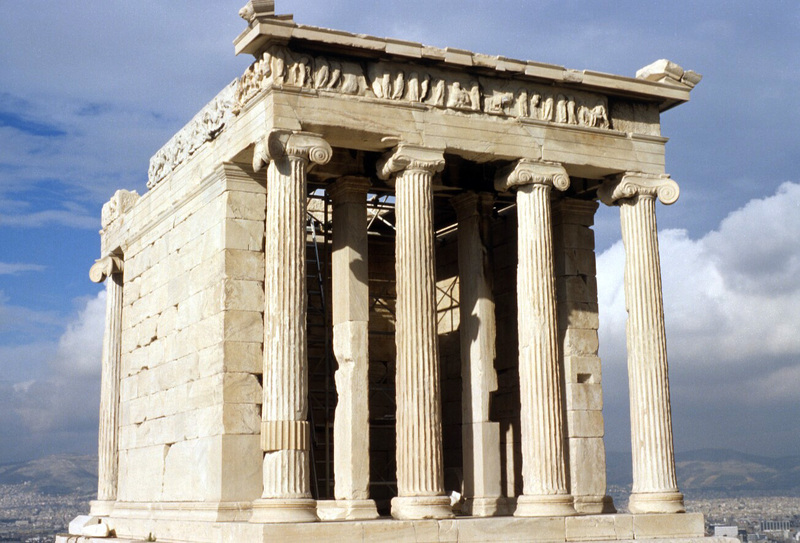 The temple was dedicated to the goddess Athena, protector of Athens. The Ictino and Calícrates architects, led by the Athenian sculptor Phidias, designed a building to house the giant statue of Athena crisoelefantina, Phidias, who would guard the cella of the temple. The entire temple project was conditional on the presence of the great statue of Athena, twelve feet high, so a cella of 19 meters wide was designed. The temple was built on the unfinished Hecatompedon, Temple took some materials. 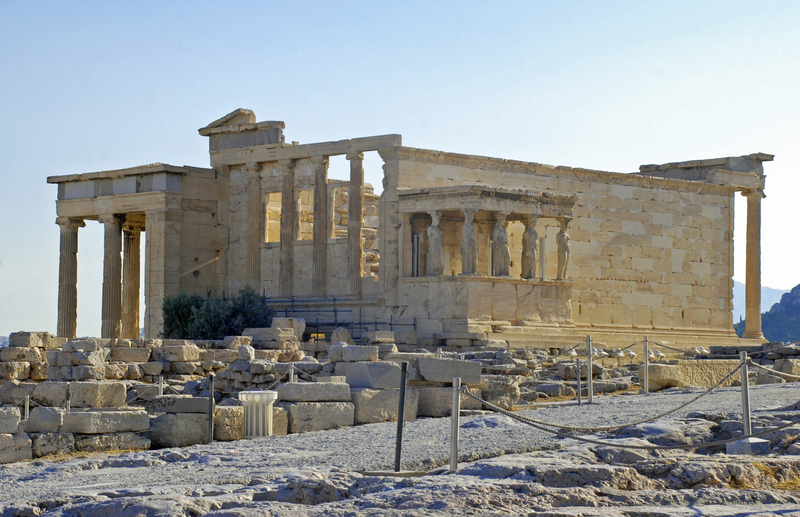 The Erechtheion is a masterpiece of the Ionic order. It was built between 421 and 406 a. C. to replace the old temple of Athena Polias that had been destroyed by the Persians in 480 BC. C. during the Persian Wars. Its name means “he who shakes the earth,” one of the penthouses epithets of Poseidon, god of the sea and earthquakes. It housed the oldest religions in the city, was consecrated to the gods Athena Polias, Poseidon and Hephaestus and the legendary king of Athens, Erechtheus, who had been struck by Poseidon and was buried there. It is located on the site of the Acropolis where the dispute between Athena and Poseidon held by the patronage of Athens. In a rock shows marks left by the trident of Poseidon and the grounds the sacred olive tree, a gift from Athena to the Athenians is. The small Ionic temple of Athena Nike (Victory), built on a tower of the Propylaea commemorates the victory over the Persians at the Battle of Salamis (448 BC), although the works began in 420 BC The architect who designed the project was Callicrates. The temple housed an image of Athena Nike, symbol of victory for the wings (Nike wingless or without wings) were cut so you never could leave Athens. The visit to the Acropolis is a unique and unforgettable experience for any traveler must pass through Athens.